It has been nearly four months since I wrote the last blog post, Farming Some Wine. It does not seem to me like it had been that long. My goal for 2017 was a monthly cadence, and I blew it big time! We finished harvest yesterday. Not with a bang, but with a whimper. What started out as a very promising year turned into something a bit more challenging. The question I asked in the last post about the abundant rainfall during flowering was answered. It hurt us a bit. Flowering is the time of year when the fruit is fertilized to become the grapes. The flowers themselves are extremely delicate, and the least bit of disruption can cause them to be knocked off the cluster, failing to fertilize what would become the grape. We saw about 15% failure, likely caused by the abundant rain during that period. As we headed into veraison in very late July, we experienced something new-to-us: Turkey damage. As you may know, Sam the Vineyard Dog crossed the Rainbow Bridge in October last year, and we have felt his loss in our hearts all year. We felt his loss in the vineyard once the sugar started to accumulate, too. I failed to give Sam the credit he was owed for the work he did to keep the turkeys out of the grapes. Sam saw all birds as the enemy, and he was diligent in keeping them at bay. His patrolling [and territory marking!] and his very noisy challenges whenever he saw the turkey really made a difference, one that could not be seen without his absence. It is like the saying that one can not appreciate the light if one has not experienced the dark. 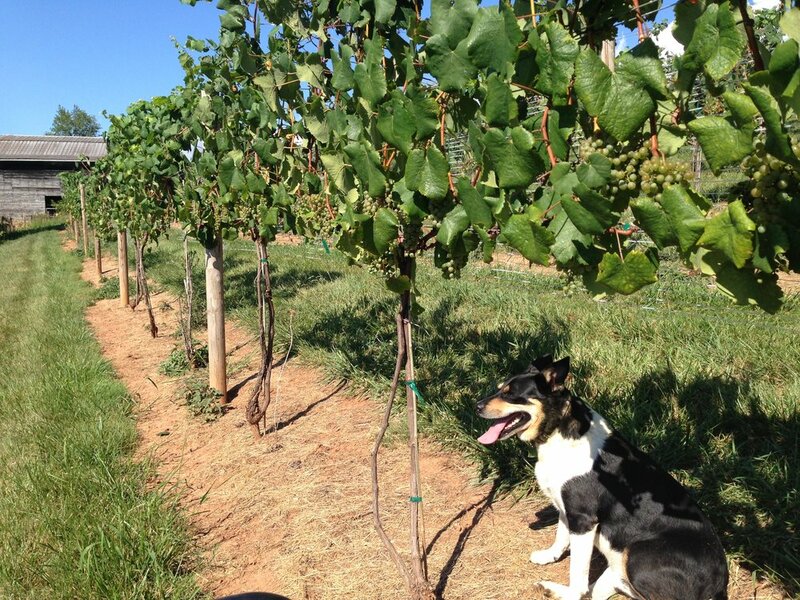 Well, one does not appreciate a great vineyard dog until one is without. For us, Sam was a pet. We got him to be a companion, a Gator-ride-loving, take-a-ride-in-the-truck, ball-retrieving, howling-at-sirens companion; that he loved being outside working the farm was just a benefit of his companionship. We miss Sam as both a pet and a hard-working farmhand. The turkey reduced our Sangiovese, Cabernet Sauvignon, and Cabernet Franc crop by about half; the Montepulciano and Petite Manseng were hit so hard, we opted not to harvest the scant fruit that was left. It was something that really hurt our overall production, in terms of quantity. The fruit we did get, however, is fantastic. I am excited about the Barbera, the Chambourcin, and the Cabernet Sauvignon, even if it is light. Our Crown & Plough [Sangiovese rosé] will be making a 2017 return. It is currently fermenting in tank. Light salmon color, crisp acidity, and a minerality that we have not seen before. It is exciting to watch it take shape. Where do we go from here? Well, one of the things that changed is we brought on a new farmhand in August. Max [Max Power] the Vineyard Dog is Sam's successor. He is a bit too little yet to have developed the sense or the mass to challenge turkey, but next growing season, the turkey that have gotten fat and lazy around here better be paying attention. It is already apparent that Max is sneakier than Sam ever considered. Just wait until next year.